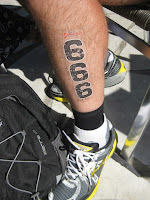 I am a strong believer that the hardest part of any Iron Distance race is writing the race report; how to start it off? Which bits are useful? Which are so interesting they need a hat on*? Should it be regaled from the time the decision to enter the race was taken or just the roadtrip itself? And should it contain the questions relating to how to start a report in the first place? Once those questions are answered the rest of the report should, in theory, just fall into place. This is my 4th Iron Distance race, and subsequently my 4th Race Report; the previous 3 races took place in 07, 08 and 09. A break from Ironman racing occurred in 2010, when myself and Mr Crash Hamster joined forces to run (sic) an 8-day Ultra event across 3 countries in the Goretex Transalpine Run (Full Race Reports, yes both of them, can be found in this Blog). Following that event, the Hamster found a new way to get a DVT, and I discovered ‘eating/drinking without exercise puts on weight’ shock! 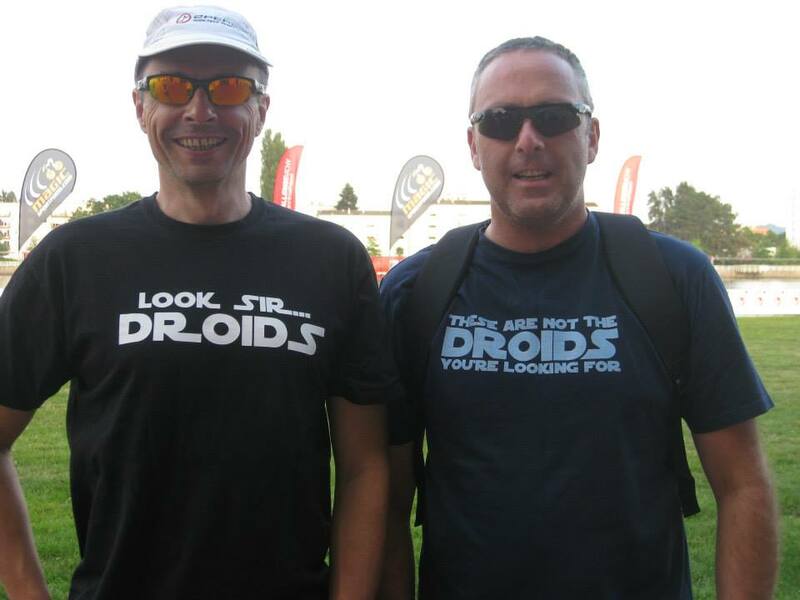 So, during 2012, a plan was hatched, so cunning…..blah, blah, etc, that we'd consider another Ironman type challenge. Now, a lot had changed since our last IM race in Switzerland in 2009, new events had appeared on the IM calendar, however, the IM brand had realised they had a captive market and could start to charge ever increasing prices for their events; however, one constant remained, you still needed to make a snap decision 12 months in advance, and hope your internet connection was faster than everybody else’s, in order to sign up for an IM race. Thankfully (aka we weren’t quick enough), there were also some new kids on the Iron Distance race circuit who offered race entry fees that didn't require a second mortgage, and races that filled up at a pace that allowed 'thinking (aka faffing)' time. A quick look at the Challenge family website for example highlighted a little race in France that looked appealing; swim (in the 'Lac'), 2 loop bike course (flat, almost downhill profile) and a 4 loop run (around the 'Lac'). Other Iron Distance races were considered but they all seemed to be somewhere called 'the UK', and I'm a firm believer that I don't do a race whose round trip travelling time is less than the time I expect to complete it (or is in Bolton); so, the 2013 Atomic Hamster roadtrip was decided: Challenge Vichy. The next few months were filled with the usual half-hearted Piratey training (sic) routine before I inadvertently recruited a ‘coach’ (aka Dis, my wife), who instructed me in no uncertain terms that she expected me to ‘do some proper training’ so that I could finish the race. I enquired if there were a few words missing from her sentence, eg in a decent time? in under 14hrs? before the finish area had been taken down?, to which she replied No, just finish, ideally with proper fuelling, without vomiting, and without dying! I was about to offer some witty response but I could sense this was an argument I wouldn’t win (Rule 1: the coach is always right, Rule 2: you know the rest). So, first stop was Google, to find out what ‘proper training’ meant, then, once my heart rate had returned to normal, it was on with the t.. tr… tr… (training Sir? ), yes, alright, the training, in a valiant attempt to achieve the coach’s goal for the race. Soon, the 28 August arrived, and so too did the Hamster family, Crashie and Squishy. The roadtrip was about to begin and off we trotted to the car hire centre to collect our bijou SUV. Things started well; Sorry guys, your SUV is not available so we've given you a free upgrade to a bigger vehicle. Cha-ching, get in there, we reply, it'll be much better for our journey to France. France you say? You plan to take the vehicle abroad? Yes! As per our T&Cs. Sorry Sir, our records doesn't mention anything about that! Uh-Oh! No problems Sir, we can add it for you now. Uh-Oh! Deep breath, pay excess, collect BMW X3 (ready for European travel) and 3 drivers, no need for the emergency driver (who was still working and couldn't be added in time); well, what's the worst that could happen. Pack car, load bikes, go to sleep, wake up really early and depart for the tunnel; then into France, in a German tank heading for Paris then on to Vichy.... hmmmm! affix Race number to belt, stickers on bike and helmet, then off to transition. 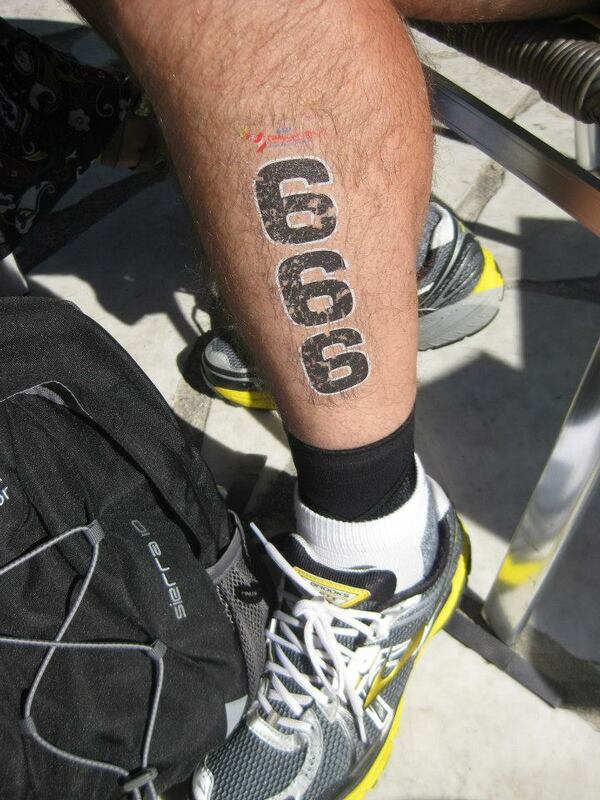 Bonjour Monsieur, your bike stickers I like, helmet too, nice partial-shaved leg, tres bon tattoos, race belt non! Pour quoi Non? Trois points of contact Monsieur. Head out of the area and bump into kindly race official who 'wittily' offers me a safety pin for 5 dollars (my, how I laughed), then a couple of photo requests from other competitors (fame at last.... sadly though of my race number, not me; oh well, back to obscurity), and back into Transition. Rack bike, hang bags, leave, wander into the expo again, meet Gavo (aka Le Grand Sand-bagger) and head off to the local Hippodrome to watch some races; slightly disappointed to find out there were no Hippos involved during the races, so left and went to bed! Beep, beep, beep.... Race day. Woke at 5am, and started to munch through breakfast. 5:45am and off to transition, arriving at 6:20am to AC/DC's Highway to Hull and an announcement from the organisers for all competitors to make their way to the start area; what? No, I still have to find a track pump and inflate my tyres, wrestle myself into my wetsuit, prep, faff, worry, and all this whilst chatting with LGS, Hamster and super speedy Dave669. Oh well, no point worrying too much, JFDI and chill to the subtle guitar riffs of AC/DC. Left Transition at 6:45am and walked along the Red carpet to the holding area; unfortunately the carpet ended some 300yds from the holding pen (nicely laid new lawn), so it was a purposeful stride across the gravel path in front of the baying spectators, whilst reminding myself of the wise words from a well known meerkatting campaign 'now's not the time to walk like a sissy, ATOM'. Rejoined Mr H, LGS and Dave669, then waited for the Challenge anthem to finish and the hooter to sound the start of the Elite and European Championship age groupers (hadn't seen them in transition, hadn't seen them in the water, unlikely to see them at any point during the race), then we were ushered towards the Lac River, to acclimatise to the slightly warmer than expected water. At some time before 7:10, the Challenge anthem once more blared out, and we girded ourselves for the impending blast on the horn that would signal the start of our wave. Off on the bike and a quick wave to Dis, the coach, then out of Vichy and up the 1st hill of the day; gentle gradient but quite long, so drop it into the small gear and spin away, don't want to blow up too early. Crest the hill and settle down for the long haul. Steady tempo, eat, drink, repeat, try not to worry about all the cyclists overtaking me, as I know they are all in the half distance sprint event, and of no interest to me or my race. Whoosh, whoosh, oh great, another sprint merchant with their super-slick bike and disc wheel; but no, it was super speedy Dave669, who, having had a suitably average swim, was now burning up the road and shouting words of encouragement. Thanks Dave, see you at the end (maybe). The Bike... there's not actually much to say about the bike really. It's not the flat fast course that it looks like on the profile. The course is a 2 lap affair, and rolls through the Val d'Allier. It starts with a long, steady climb out of Vichy on the hill of varying gradient (where, by a genius feat of engineering, the villagers are able to make the hill steeper for lap 2), then rolling along the top of the Valley, a left turn took us into the dark forest of stillness (where all the trees from the rest of the course have been herded together to shelter you from the wind), before you are launched into the daylight and down the hill of bleak views (where you can survey the barrenness of the landscape of agricultural flatness ahead). The next 50 or so kms are spent travelling around the ghost villages of the Auverne, sure it's a Sunday and many a church bell was tolling, but where in the bible does it say, and on the seventh day God said thou shallt ignore cyclists and offer no support for they do not payeth road tax? Thankfully there were 5 aid stations of plenty that were fully manned up with kindly folk dispensing all manner of goodies; unfortunately there was also a lack of any loud blaring music and associated noise, for the gentle folk did not approve of such wicked behaviour (apparently; either that or electricity hasn't reached the villages and the locally grown wind turbines are only there to allow the locals to increase the wind speed should a 2 lap cycle race happen to be organised on a Sunday). The end of the circuit found us cycling through BerylReid, a suburb of Vichy, famed for its magic roundabout; magic for many reasons, not least that it provided a nice gathering of spectators (well on lap 1 anyhow), but also,an ingenious navigation system that required a degree in Quantum Physics to fully understand (unless you learnt to drive in Swindon, in which case it was simple navigation). Approach roundabout, wave at Dis, avoid cars, try to understand why the crowd are shouting 'a gauche, a gauche', look up, spot gendarme furiously waving arms, spot traffic 'sort of' stopping 'a gauche', swerve to avoid the island in middle of road splitting the gauche lane from the droit lane, turn gauche, 100yds sharp droit, whoa! Aid station (if only they were playing music, and not hiding round the corner as if playing scare the cyclist!) fumble for drinks bottles, discard collect new supplies, whoa! Sharp 90 degree gauche turn, 100 yds 90 degrees droit, then up a hill to rejoin the loop for lap 2. The Run... the run at Vichy is 4 loops of 10.4km, and involves running past transition, through the finish area into some park land, along one side of the river, up and over 1 bridge, down and under same bridge, along other side of river, climb 20 (steep) steps, continue along side of river (only slightly higher), up and over 2nd bridge before dropping back to transition to repeat. All traffic (aka runners) move in the same anti-clockwise direction, and there are no loop-backs points on the course (so no where to shout encouragement/abuse or high-5 your fellow competitors). As such, you tend to get stuck with the same group of runners, some moving ahead, some drifting back, and all the time, you're experiencing lap band envy (a lap band is issued at the start of each lap, and the aim is to collect all 4 bands in order to open the portal into the finish arena). quick chat to explain that Mr H may have been involved in an accident, not sure if he's continuing so be aware (your country needs wares, and all that). Plod on and eventually reach aid station 4, and answer a call of nature; exit the French port-a-loo, a device no doubt built as a rival to Madame Le Guillotine, and spy a yellow and black monaco in front; seems to be moving well, quite tall, might be Mr H, I'll try to catch up.... after increasing my pace to 7:50 min miling, and watching my HR rise, and the gap getting steadily larger, I realise that it probably isn't Mr H, so it must be LGS; it was the last time I'd see Gavo until the athletes area after the finish. Nothing else happened. Lap 2: Pace dropping, ankle hurts to put constant pressure on but can cope with power-walking (last mention of the ankle, can't go for the sympathy vote, Mr H was cashing in all of those). Head down, stride out, overtake people who are 'running', approach aid station 2 (my favourite); take water, energy... hey Dave, do you want a beer? (bit early for delirium to be setting in I thought) Of course I want a beer, I mean, is the Pope a.... erm, sorry, ignore that, yes please. Handed bottle of beer, woo hooo, ankle less sore, and now I have 2 targets on a run lap; a wave, cheer, kiss from Dis and a Beer from aid station 2, c'mon. Stride, run, shuffle, repeat. Get overtaken by people, like GBR Viz (Hi Viz); overtake (briefly) people, like GBR Girl, who couldn't believe how far the event was, but was on her penultimate lap, and just needed the motivation of being overtaken by a Pirate (all be-it a lap behind) to get her running (very quickly I may add) again. Lap 3: Aid station 2, water, coke, beer, M&Ms, Dis, bridge, steps (other teen groups were available), Go Pirate, Yaargh, no idea who, just seemed apt. Post-Race: After the finish, it was back to the athletes 'village' for food, drink (mmm, beer), shower and change. Met Gavo (aka LGS) in the food hall and congratulated him on his 1st Iron distance race (12h 45m, not bad at all, Sir), then back out to the stands to support Mr H and the final finishers. Met Dis in the stands along with Dave 669 and a group of ladies from Racing TNT. Dave 669 had finished in 12h 30m, and was hanging around to watch the Hamster finish, the ladies from Racing TNT seemed to be enjoying themselves and having a great day out. At 10pm, the finish line party really started to rock, the barriers were opened and the spectators were invited into the finish area to provide an arrival tunnel for finisher in the last hour; the Mic Men were high on something but nobody seemed to care. With each new athlete 'spotted' so the atmosphere grew, until, at last, Crash Hamster (like name, like nature) hobbled into view ably escorted by his wife Squishy. 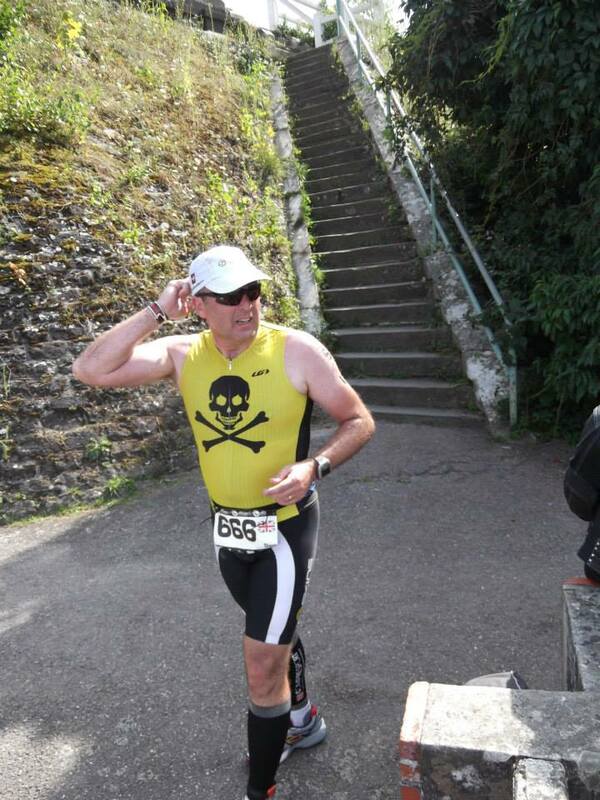 I was able to hand Crashie the Pirate Flag so we could claim Vichy as ours (they don't have a flag you see), then he duly crossed the finish line and collected his medal from the 2nd lady finisher (aka 1st loser). See Hamster, get more injured and they'd have invited the 1st lady home to award your medal (bit like winning a VC but without dying). Dis and I collect bikes and kit, head to hotel, store bikes in lockable garage and at 1:30am, go to bed. Vichy has so much potential. Lovely region – difficult to get to. That said, it was a top trip. Great weather, fab company, food, beer and wine. I like Challenge, I like what they (currently) stand for, they promote a family friendly event and Vichy was excellently organised. Thanks to the Coaches and Zoomers for their friendly welcome, supportive advice and waiting for me/looping back when I drifted off the back of the peleton. Well done Gavo (LGS), nice to meet you and Shirlee, and top racing Sir. Crash Hamster, what can I say. I could embrace what all your fellow competitors said, about being an inspiration and all, but I prefer the quietly, understated, response that Dis heard on the Run course: Dis 'Yay, Go Pirate, Well done Crashie, loads of people have said you're a true inspiration' Reply (uncredited) 'No, I'm a tw*t'. Bike handling skills lesson already bought for Christmas Sir. To Coach Dis, my lovely wife, thanks for your encouragement and support during the past 9 months; I promise to continue to train, especially concentrating on core strength and converting the 12 gallon barrel into a pseudo 6-pack, so that I may be able to achieve a sub-12hr IM race.